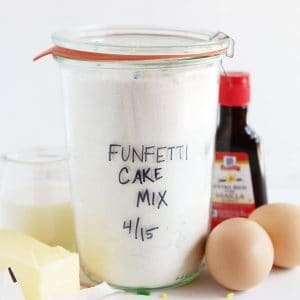 This Homemade Funfetti Cake Mix is the best way to enjoy a sprinkle filled cake! You will find that this is one of the best tasting cakes you will ever have, not to mention fun to look at! Add all the dry ingredients to a bowl and sift. Add the rainbow jimmies and stir by hand until combined. Pour all dry ingredients into an airtight container and store for up to 3 months. Place softened butter into stand mixer and mix on medium for 1-2 minutes. Add milk, oil, vanilla and eggs and mix on low for one minute. Place dry ingredients into stand mixer and combine on low for 30 seconds. Remove from mixer and scrape down sides. Finish stirring by hand if not all combined. Pour batter into prepare pans. Bake at 350. For 9-inch pans its 20-25 minutes. For cupcakes start checking around 15 minutes. Cool before frosting.